Polly Newton has one single-minded dream, to be a starship pilot and travel the galaxy. Her mother, the Director of the Mars Colony, derails Polly’s plans when she sends Polly and her genius twin brother, Charles, to Galileo Academy on Earth–the one planet Polly has no desire to visit. Ever. Homesick and cut off from her own plans for her future, Polly cannot seem to fit into the constraints of life on Earth, unlike Charles, who deftly maneuvers around people and sees through their behavior to their true motives. Strange, unexplained, dangerous coincidences centered on their high-profile classmates begin piling up. Charles may be right–there’s more going on than would appear, and the stakes are high. With the help of Charles, Polly is determined to find the truth, no matter the cost. One of my goals for 2017 was to read more science-fiction, so I was very excited to get my hands on this book! The near-future, Mars colonisation aspect of the story did not disappoint, and I really enjoyed our protagonist, Polly. Also, I’m always here for any story set in a boarding school! although I did have some issues with the pacing, I enjoyed the book overall. 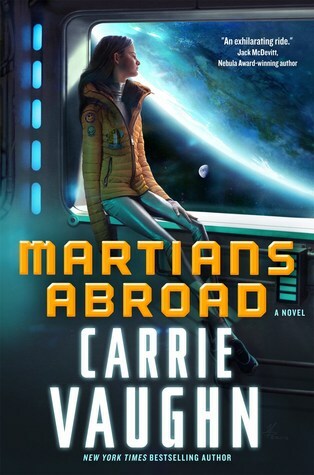 Check out my review video if you want to hear more of my thoughts on Martians Abroad! You can also enter the giveaway below for a chance to win your own copy: the giveaway is open internationally until midnight on 3 February 2017 and the winner will be selected at random by Rafflecopter.